The achievement gap, along with obesity, teen pregnancy, and mental illnesses continue to be huge problems in education. It is very important to attempt to correct these issues in hopes of increasing student focus, improving their behaviors, and encouraging a higher degree of learning within the classroom. Especially because studies have proved that organized physical activity can significantly contribute to higher quality of the development in the children’s fine motor skills and abilities, which in turn strengthens the overall health of a child and contributes proper physical and mental development. Working at Valley Oak High School, Napa Unified's local credit recovery or continuation school, I have realized that a lot of my student have an ill taste for physical fitness and have learned very little about nutrition, mental health, emotional health, or effects of drugs/alcohol. ​I would like to give my students something that they may have never gotten before and that is the opportunity to maintain a healthy and fit lifestyle by providing them access to information that will help them be successful in all aspects of their lives. Assess to this information can be delivered in multiple different ways, especially by utilizing technology. Studies show that higher test scores go hand in hand with an increased amount of physical activity opportunities, yet statistics indicate 12.7% of children in America are either overweight or obese. In 1991 41.6% of high school students participated in a physical education class. After the No Child Left Behind Act of 2001, 14% of school districts in the United States decreased time allotted for physical education to accommodate math and English. Then in 2003 only 28.4% of high school students participate in physical education and some type of sport. There is an immense need to educate young people in the areas of Health Science and Physical Education. Teaching them how take care of themselves emotionally, socially, and physically, so that they can become productive and contributing members of society and fulfill a healthy and active lifestyle. 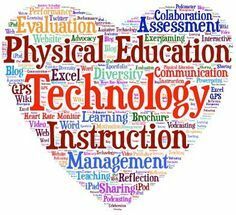 Not only do the studies confirm the relationship between physical activity and academic achievement; they also indicate a need for technology in a physical education classroom, but finding ways to bring Health Science and Physical Education into the 21st century by utilizing technology in both settings has proven to be difficult, especially due to a lack of resources.